Baked Irish Potato Skins loaded with Smoked Gouda Cheese and Applewood Smoked Bacon. Served with Yellow Mustard and our very own McGuire’s Red Ale Beer Cheese. Flash fried and sprinkled with Parmesan Cheese. Served with Marinara Sauce. Flash Fried Pepper Jack Cubes, Mozzarella Sticks and Wisconsin Cheese Curds. Served with Marinara. Homemade Irish Eggrolls with Corned Beef, Sauerkraut and Swiss Cheese. Served with Thousand Island Dressing for dipping. Garlic Mashed Potatoes rolled in Herbed Bread Crumbs and Flash Fried. Served with Salsa, Guacamole Dip and a Horse Radish Sour Cream Sauce. Invented by McGuire’s Cousin Nathan in Old Mexico. Mucho Grande!! There is No Better Steak in America . . . Period! 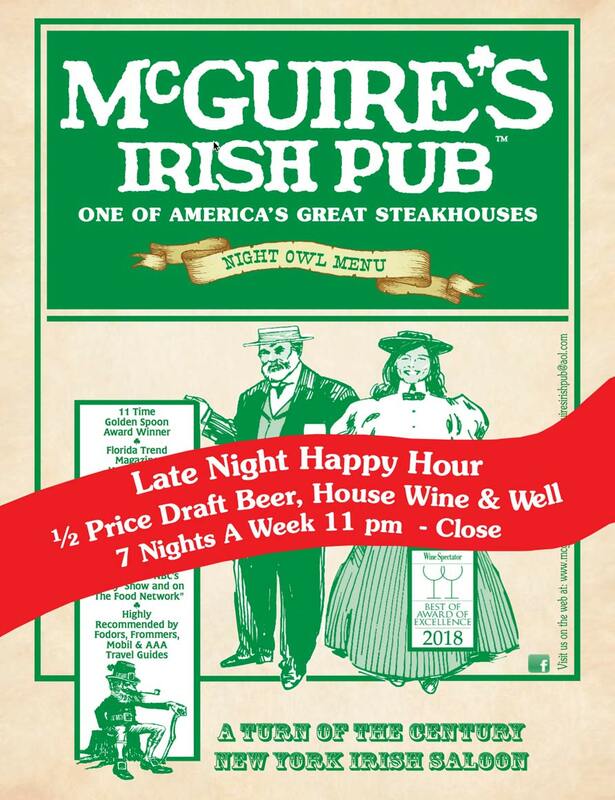 McGuire’s Irish Pub is one of a select few Restaurants in America to serve U.S.D.A. Certified Prime Steaks. Less than 5% of all Beef is good enough to be graded “PRIME”. Supermarkets don’t sell it. World Famous Restaurants don’t serve it! McGuire’s Steaks are never frozen, and hand cut daily and grilled over hickory wood fires to your specifications. ONE POUND (16 oz.) Cut from U.S.D.A. Certified Prime Aged Beef grilled over wood fires and served sizzling in Garlic Hotel Butter. Our U.S.D.A. Certified Prime N.Y. Strip Steak loaded with Cracked Peppercorns hammered in to form a Pepper Crust. Very Hot!! An Outstanding example of U.S.D.A. Certified Prime at its best. This Steak has the most fat marbling of all the Prime Cuts, which makes the Ribeye flavorful and tender. Cut daily here at McGUIRE’S from Prime Ribs of Beef with extra Fat for extra flavor. 12 oz. cut from our choice beef tenderloins. 8 oz. filet mignon cut from our choice beef tenderloins. Bleu Cheese Crumbles or Merlot Mushroom Sauce added to any steak. All of the above are served with House Salad and Natural Fried Irish Potatoes. Free Range Fresh Fish and Shrimp battered in McGuire’s Red Ale and Flash Fried. Served with Cole Slaw. Seasoned in a Black Mustard Irish Whiskey Glaze as served by McGuire’s Chefs at The Distinguished James Beard House in N.Y.C. Fried to a Golden Brown in Pure Low Cholesterol Oil Served with your choice of House or Caesar Salad & Natural Fries or Asparagus. Free range fresh fish caught daily in the Irish Sea by McGuire’s Cousin Nathan and battered in McGuire’s Red Ale. Served with Cole Slaw. Smoked all night in our Hickory Smokehouse with a Honey BBQ Glaze. Served with Homemade Baked Beans and Potato Salad. 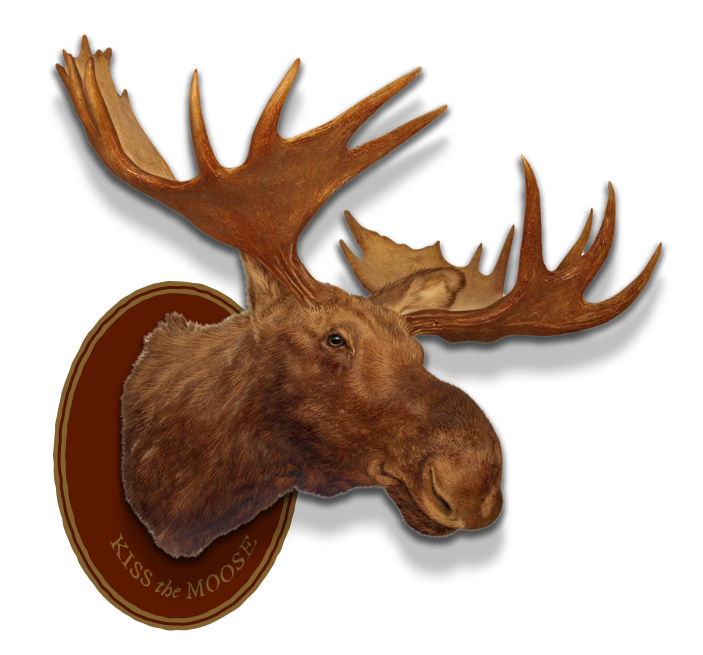 Can be served on your choice of Kosher Rye, French, or our Old Fashioned Toasted Kaiser Bun. All Sandwiches served with Irish Fries. Our special combination of Corned Beef and Pastrami with melted Deli White Cheese on Kosher Rye Bread. The finest Pastrami available - Hebrew National on Kosher Rye Bread. Charbroiled Free Range Chicken Breast with Kosher Smoked Ham and Melted Swiss Cheese on French Bread. Dynamite combination of Corned Beef, Swiss Cheese and Sauerkraut with Thousand Island Dressing on Rye Bread. Served with Natural Fried Irish Potatoes . A Dieter’s Delite! Crisp Lettuce, Red Onions, Grape Tomatoes, Red & Yellow Peppers,Cucumbers, Carrots, Pepperoncinis, Bacon, Smoked Turkey, Kosher Ham, Cheddar & Mozzarella Cheeses and a Whole Boiled Egg. A true McGuire’s portion; a 1 POUND slice of New York Cheesecake topped with homemade Cherries Jubilee, enough to share but you don’t have to!